Mom makes the best chocolate meringue pie. Growing up, I’d watch her cook the filling on the stove and lick out the bowl once it was cooled. She has this old cookbook that has a recipe for “Man Pleaser Chocolate Pie”, which always made me smile when I saw it. Once I was old enough to realize how amazing homemade pudding is all by itself, it became my go-to dessert. I like to make a batch and eat it all by myself. Sorry, Michael! Stovetop pudding is amazing, and compared to the instant kind, well, it just blows it away. I used to make that instant kind with half the milk just to get more flavor! I love that homemade pudding only takes a few ingredients and about 15 minutes to whip up. This recipe is nice because it doesn’t involve separating eggs and resulted in a smooth, dark chocolate pudding. 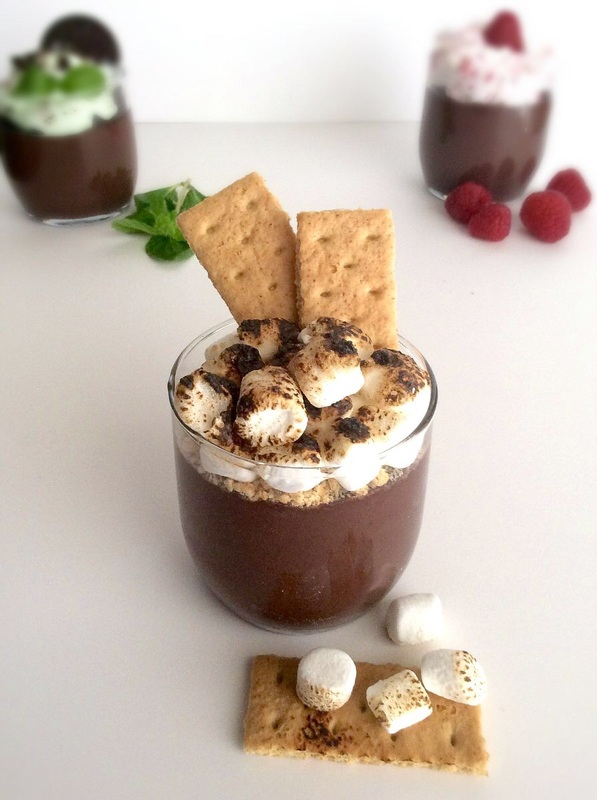 I had a terrible s’mores pudding dessert at a restaurant awhile back and have been wanting to re-create it just to “fix it” ever since! 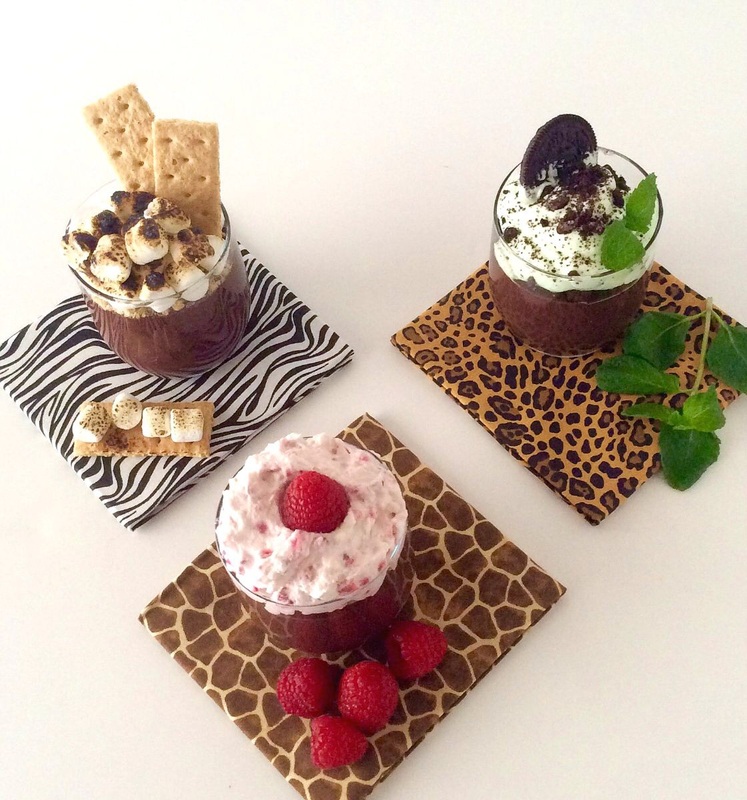 So from the base of rich, thick pudding, I created a raspberry cheesecake, a chocolate mint, and a s’mores version. If you ever need an easy dessert and want to make it fancy for company, try out one of these versions below! Combine cornstarch, cocoa, sugar and salt in medium saucepan. Whisk in a small amount of milk to form a paste and then add the rest of the milk once the cornstarch mixture is smooth. Heat on medium-low and stir occasionally with a whisk. After 10 min, before simmering, the mixture will thicken slightly. Add chocolate chips, and stir until chocolate is fully incorporated and mixture is thick. Remove from heat and stir in butter. Distribute among individual cups or one large bowl, cover, and chill until set, 2 to 3 hrs. 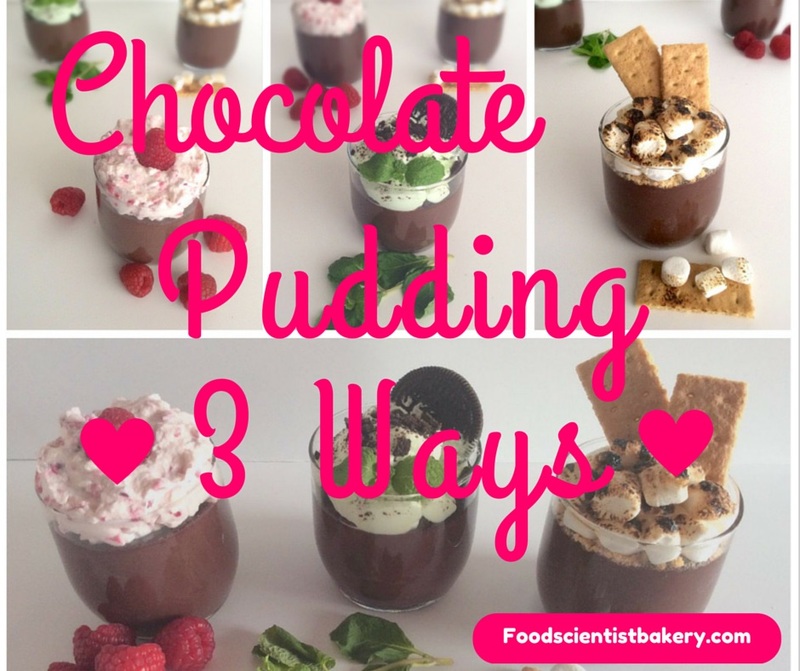 This pudding is good for 3 days in the fridge. Add 1 t. raspberry extract to the pudding before chilling. Whip ½ c. whipping cream, ¼ c. powdered sugar, and 2 oz. cream cheese in a stand mixer until thick. Add ½ c. fresh raspberries and blend. Top pudding cups with mixture before serving. Add 1 t. peppermint extract to the pudding before chilling. Whip ½ c. whipping cream, ¼ c. powdered sugar, and 1 t. peppermint extract in a stand mixer until thick. Add green food dye if desired. Top pudding cups with mixture and sprinkle with crushed Oreo crumbs before serving. Crush 4 graham crackers and use the crumbs to top pudding cups. Add mini marshmallows to fill each cup. Use a kitchen torch or oven broiler to torch marshmallows carefully. Top with graham crackers before serving.